I absolutely love the shape and look of cakes. There is something about a circle that is just so perfect and pleasing to my eyes. It is probably a good thing that my baking skills are not awesome, cause I would shoot cake everyday of the week if I could. I have been following linda lomelino from Call Me Cupcake on Instagram and I absolutely admire both her baking and cake shooting skills. She fuels my urge to bake and luckily I have my friend Talz who can bake a mean cake for me whenever I feel like I need to sink my teeth into a cake shoot. 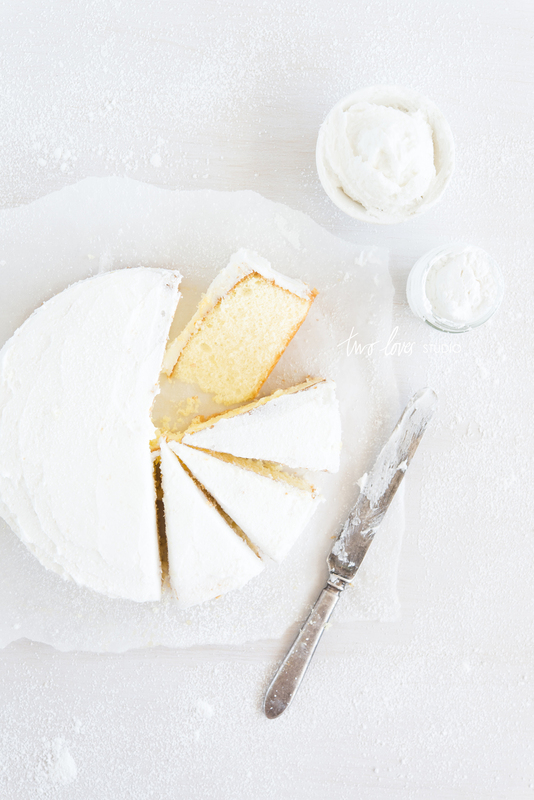 This is Talia’s simple butter cake recipe with her to die for buttercream icing. I really wanted to focus capturing the simple yet pleasing shapes, textures and tones that we all associate with cakes. The way the light bounces off the sponge, you can almost feel how moist and fluffy the cake is. Although I didn’t make this cake, I sure made the icing and it was perfect! So easy to make, light, fluffy and easy to spread. I made the icing from Talia’s Cupcake Dream e-book. 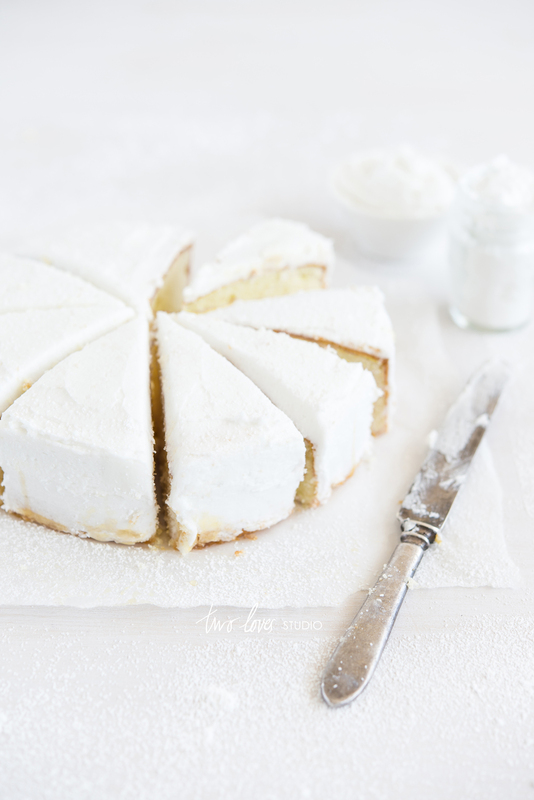 I also made a double layer version of this cake by baking two separate butter cake layers and I’ll share that shoot with you a little bit later. Preheat the oven to 180 C (350 F). Grease and line the bottom of a 22cm (8.5″) deep round cake tin. Cream the butter, sugar and vanilla extract with electric beaters on medium to high speed until light and fluffy. Add the eggs one at a time, until well combined. Sift in the flour and add the milk in 2-3 batches . Gently stir after each addition until well combined. Pour the mixture evenly into the prepared tin and bake for 60-70 minutes, or until golden on top. Test with a skewer in the middle to check that the cake is cooked through. (The cake works well if you cook it at 180 C (350F) for the first hour, and then reduce to 160 C (320F) for the last ten minutes or so). Allow the cakes to completely cool in the tin on a wire rack before turning the cake out. To make the icing; combine the vegetable shortening and water in a bowl then use an electric mixer on a low-medium speed to cream them together. Sift in the icing sugar. Add vanilla extract. Combine on a low speed, then beat on a medium speed until creamy and fluffy. Refrigerate until ready to use. 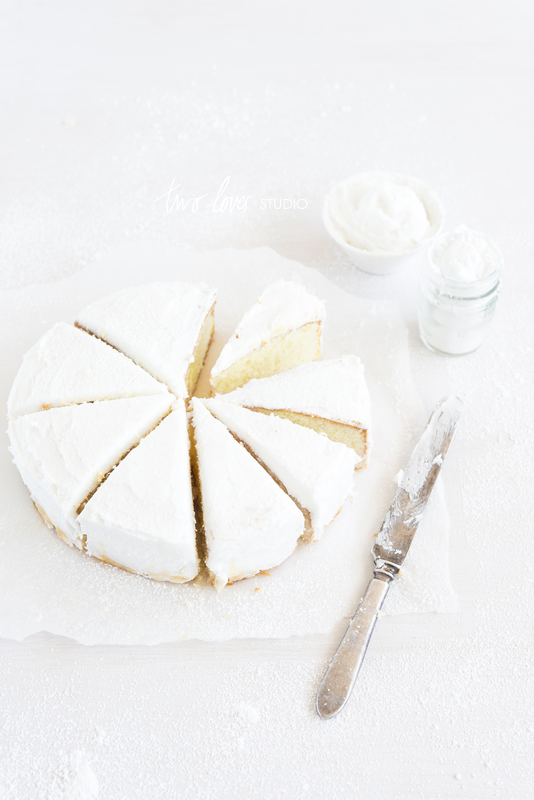 When ready to serve the cake, spread the icing evenly across the entire cake with a knife. I love the idea of making a cake with a friend … especially one as beautiful as this! Love the all-white effect of your photos. Truly beautiful!